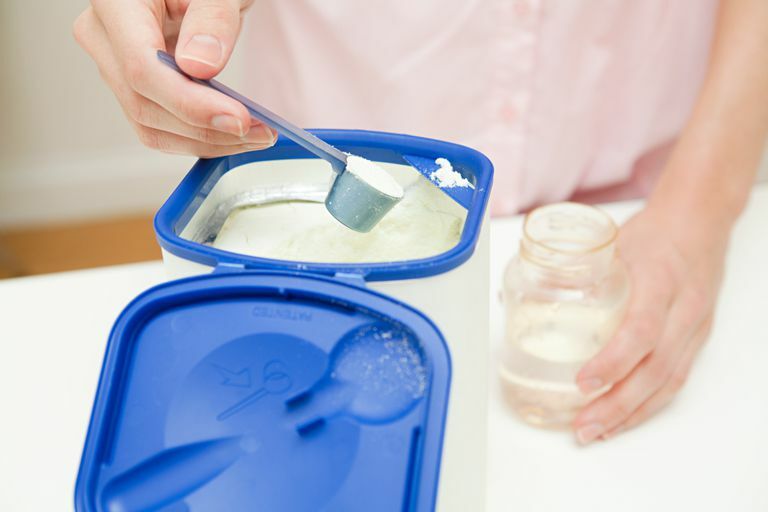 If you are trying to choose an infant formula for your baby, you might feel overwhelmed by the options available. It is not as simple as simply walking into the store and picking up a can of formula. You may find yourself overwhelmed with the options. Here's a breakdown of the most common types and when you might choose one over the other for your baby. This is the most common type of formula made. About 80% of the formula sold will be based on a cow's milk protein. The milk proteins are treated to help them be broken down by your baby's digestive tract. These formulas also have iron added to them, which is recommend by the American Academy of Pediatrics (AAP) to help prevent iron deficiency anemia in a child under one. You may also notice that many of these formulas also have docosahexaenoic acid (DHA) and arachidonic acid (ARA) added to them. These additives are thought to be beneficial when it comes to the development of your baby's brain and eyes, but these fatty acids are still being researched. You may hear that there are pre-digested formulas available, what that means is that the cow's milk proteins have been broken down into smaller proteins to make them easier to digest for babies. If you have a baby who is at a higher risk of developing allergies or who have shown symptoms of allergies to other formulas, your pediatrician may recommend a hydrolyzed formula. These formulas are also more costly. These formulas are really expensive and may even be prescription only. They are designed for babies who have very specific diseases. You may not be able to locate these easily and may even have to special order through a pharmacy or your pediatrician. As I said most of the infant formulas are fortified with iron. You will also find low iron formulas. Breast milk, which is what infant formula tries to mimic, has very little iron. A low iron formula mimics that, however, unlike breast milk, where nearly 100% of the iron is absorbed by the baby, the iron in formula is not absorbed as well. So even though an iron-fortified formula has more iron, the baby absorbs less. This means that you should probably not choose a low iron formula without a good reason. Availability: Can you easily find the formula where you normally shop? Usability: Does your baby tolerate the formula well? Is baby growing appropriately? After all of these factors are taken into account you will likely have at least a few good options given all of the formulas that are out there. If you are still having difficulty deciding, remember that you can always change if it's not working. Caring for Your Baby and Young Child: Birth to Age 5. American Academy of Pediatrics. 2009. Formula 101. Food and Drug Administration (FDA). February 27, 2015.